Gilbert Rhoades Thomas, age 97, was called to Heaven with a quiet whisper on Friday, December 22nd, 2017. He has gone to join his parents, Chester and LaNell, his brother, William, his sisters, Marian, Corinne, Beverly and Caryl, his loving wife of 45 years, Joan, and his beloved son, Bill. Gib will be dearly missed by his children, Nancy and Todd Mears, Laura and Darrell Telman, Lisa and Dan Gendler, Patti Thomas and Cheryl and Dennis McCarthy (Leawood, KS) as well as his grandchildren, Alexa & Gibson, Kurt, April, Jeffrey & Melissa, Ellyn & Karl, Kellee, Kate & Bill, Meghan & Sean and 12 great-grandchildren. He will also be dearly missed by his good friend, Andy Dykema, with whom he shared many friends and wonderful experiences. Gib was born and raised in South Dakota during the Great Depression. 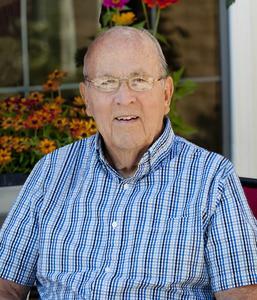 He attended South Dakota State University, earning a degree in business administration and then served proudly and honorably in the US Marine Corps on the Solomon Islands, Okinawa, Guam and in China during WWII. He returned home, married his first wife of 16 yrs., Dorothy Kraas of Greenville, and settled in Grand Rapids where he became a successful businessman. He pioneered the self-service laundry business in Grand Rapids and western Michigan and was a member of West Michigan Telecasters Inc. investment group which brought WZZM TV13 to Grand Rapids in the mid-60’s. He was active in county politics in the 50’s and 60’s and was the chairman of the Kent County Board of Supervisors in 1961. He realized a life-long dream when he began raising Polled Hereford cattle on his farm in Sparta and successfully raised and showed many state and national champions partnering with and gifting many animals to Michigan State University. He was a realtor with Greenridge Realty, was an avid sportsman and loved spending time at the family cabin he helped build on the Big Manistee River. He was a member of the York Masonic Lodge, the Saladin Shrine, (Past-Potentate), life member of the GR Elks Club and Greenridge/Egypt Valley Country Club where he was elected its 1st president. Gib was a member of First United Methodist Church and also attended Second Congregational Church. Always ready to enjoy life with good humor and a twinkling eye, Gib, with his warm and generous heart, will live in our hearts always. A funeral service will be held at First United Methodist Church, (227 Fulton St. SE, Grand Rapids), on Friday, January 12th at 11:00 a.m. Please join the family for a luncheon at the church following the service.